We offer traditional Japanese Teppanyaki dining, allowing customers to enjoy a unique experience where specially trained chefs prepare your meat, seafood and vegetarian meals at the table. A la carte and dinner course options are available for Teppanyaki style dining. Customers who wish to book a place at the sushi counter or table in our main dining area can enjoy a number of hot and cold dishes from the a la carte menu. 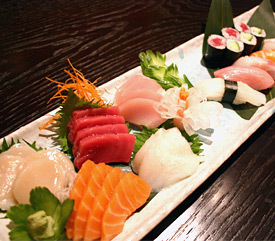 Fresh sushi/sashimi is prepared at the counter by highly skilled chefs trained in Japan. The private area provides an exclusive dining experience for up to 10 people.